"Do I hafta sign it?" 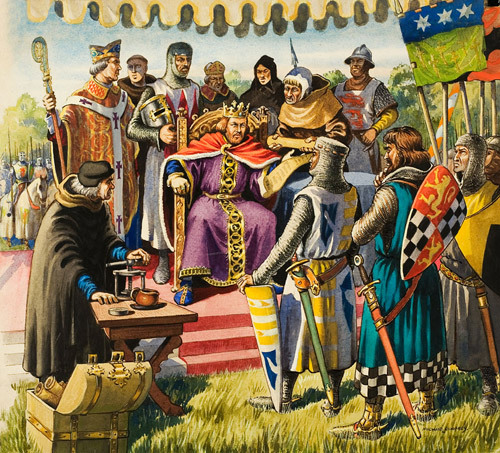 In England, relations between the king and his vassals (called barons) dictated the rights and duties of each. The barons provided military services to the king in return for protection and land. The king was supposed to consult his barons before raising taxes or demanding service. It was during the reign of King John that this fell apart. After losing English possessions in France, John imposed taxes without consent, a violation of the law. After another military disaster in 1214, John tried to collect more money. This time, the barons revolted. The rebels captured London but did not defeat John. By 1215, the two sides began to negotiate. The Magna Carta (in Latin, "Great Charter") was the result, and John agreed to it at Runnymede, a meadow near Windsor. 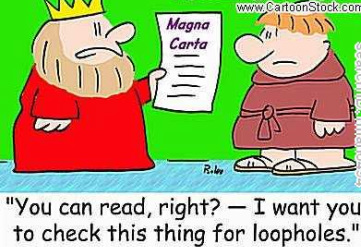 The Magna Carta outlined the barons’ rights and prohibited the king from changing anything without their consent. It stated that all free men in England had certain rights that the king had to respect. As the definition of free man became broader (in 1215 it applied to the barons and their vassals), the Magna Carta came to be seen as a "declaration of liberty" for all Englishmen. (It would also provide an intellectual argument for the colonies during the American Revolution.) 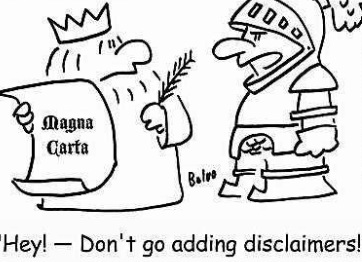 The Magna Carta did not really weaken the power of the king, but it did state that he was not above the law. The king had to work with his barons. If the king refused to work with his barons, he suffered hostility and even open rebellion. Magna Fries at Quaker Steak & Lube. Ummm... yes, please. The Magna Carta contains 63 clauses; #39 did away with "Trial by Ordeal" where the accused were bound and thrown into a lake. If they sank = innocent. This established the idea of trial by jury. The importance of the Magna Carta lies more in its symbolism than in its words. The U.S. Founding Fathers latched onto the Magna Carta's ideas of "no taxation without representation", equal access of courts, and trial by jury. Depictions of King John during the 19th Century were less than favorable and heavily influenced by Sir Walter Scott's historical romance, Ivanhoe. Scott's work impacted Howard Pyle's story The Merry Adventures of Robin Hood. This children's book established John as the main villain in the Robin Hood narrative. 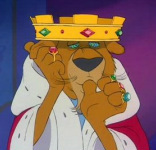 The Disney cartoon version portrayed John as a cowardly, thumbsucking lion. King John appealed to the Pope, saying his signature had been extorted by force. The Pope agreed and nullified the Magna Carta. The barons revolted again. John died in 1216 and his son (Henry III) was forced to reissue it in 1225. At Quaker Steak & Lube, their Magna Fries is Latin for "Great Fries". 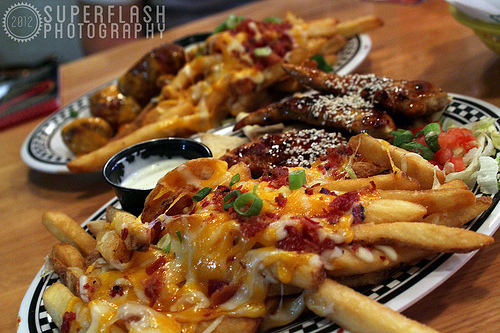 The name says it all... because there's bacon on top [pictured left].